Every version of the very known and famous email client application Outlook, by the American Tech-Giant – Microsoft, has brought not just improvements but has put in efforts to enrich the user experience onto a new level. If we dive into what MS Outlook was at first, then the whole picture would appear like a normal application which has details, colors, and everything but the difference in quality is easily visible; and you can notice other features with no efforts at all. But as time has passed through, Outlook as an email client has experienced numerous changes & improvements. Microsoft Outlook 2019 is the latest serve on the plate by the software giant preceded by Outlook 2016. With Outlook 2019 Microsoft is working hard on user feedbacks and trying to give what is best for the consumer – after all, they are paying for the service. Since the start – when Outlook was first made available, users have developed their way of how they interact with this amazing tool and how they manage the work stuff. Due to limitations on the PST file size in earlier releases of Outlook, many users opted to create more than one PST file to store the mailbox data as per their preference. The number of PST files is also related to the number of Outlook accounts they are running. But later, say with the release or availability of Outlook 2013, Microsoft took off the file size limit of both PST & OST Outlook data files. The Outlook data file size limit has been increased to 50 GB by default, and that’s not it, if you need more space to handle continuously emerging mailbox data, for example, Contacts, Calendar, Events, Attachments, Notes, etc. You can increase the default file size by making tweaks in Windows Registry settings. As it is pretty hard to maintain multiple Outlook PST files, but you can have the option of unifying all other accounts! By unifying, the idea is to merge all the PST files and turn it into one single file. How would you merge Outlook PST file(s)? Well, it sounds great that you can do such thing and reduce the effort you put in daily, but the question is how would you merge – unify, all of the Outlook PST files into one without messing anything and not losing the data. 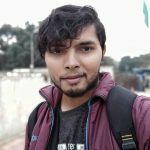 Let’s talk about if it is possible with the help of native methods, which means if it is possible using Outlook application itself and without downloading anything in extra. The answer is Yes, you can do so, but the native approach of merging multiple PST file(s) into one is remarkably ineffective as there are loopholes in the whole process of a native method. Firstly the level of complexity is a bit higher in the native approach, and it is necessary for the person either to research before proceeding or he/she should have a technical understanding regarding the method. And secondly, during the whole process there is no guarantee to ensure the safety of your precious data. When all the workarounds fail, and there is nothing left for you to try out, installing a professional tool is the last & best thing to do. Well, many benefits are associated with a tool like you will save time, ensure the file structure, ensure zero data loss, no change in the data hierarchy, no technical expertise required for using a tool, fast results, etc. Kernel Merge PST is a dedicated tool is specially designed for the job of merging Outlook PST files. You can merge both UNICODE and ANSI PST file without any limitation or restriction. The tool offers features such as the option to choose between merging multiple PST files, the option to select location irrespective of whether the storage is internal or external, advanced filter options and wide support for all versions of Windows Operating System. And you can choose either to directly buy the appropriate license or download the trial version and use the tool for personal evaluation, and upon satisfaction buy the license. Kernel Merge PST tops the job with accurate results and fully ensures data safety. And as per the requirement, flexible plans are offered whichever suits you, and our customer care is up for 24/7 customer support. 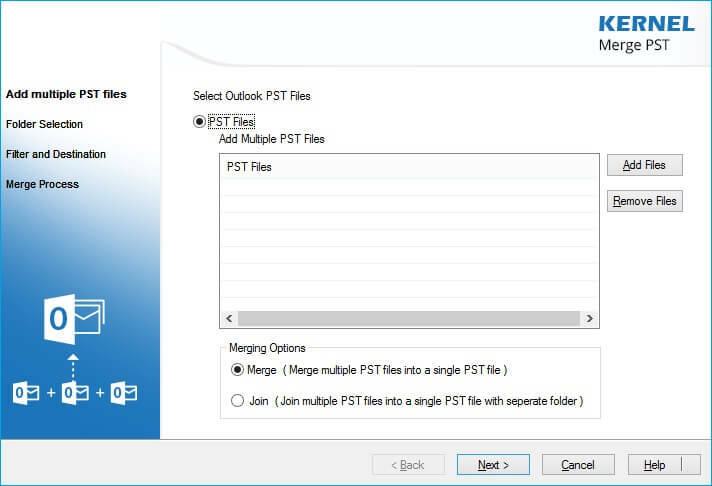 How to Merge Multiple Outlook PST Files?